German gun-launched missile. 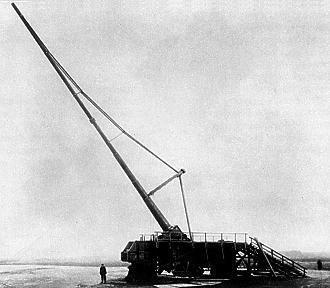 The Paris Gun of World War I could hurl a 120 kg shell with 7 kg of explosive to a range of 131 km and an altitude of 40 km. AKA: Kaiser Wilhelm Geschuetz. Status: Retired 1918. Payload: 120 kg (260 lb). Gross mass: 120 kg (260 lb). Diameter: 0.21 m (0.68 ft). The Paris Gun of World War I (called by the Germans the Kaiser Wilhelm Gun and often incorrectly termed Lange Max or Big Bertha, two completely different guns) was the direct ancestor of the V-3. The rail-mounted weapon was 34 meters long and weighed 125 metric tons. Its 180 kg powder charge could hurl a 120 kg shell with 7 kg of explosive to a range of 131 km. During the 170 second trajectory the shell reached a maximum altitude at the edge of space - 40 km. This was the highest altitude attained by a man-made object until the first successful V-2 flight test on October 3, 1942. From March through August of 1918, three of the guns shot 351 shells at Paris from the woods of Crepy, killing 256 and wounding 620. As a military weapon the gun was a failure - the payload was minuscule, the barrel needed replacement after 65 shots, and the accuracy was only good enough for city-sized targets. 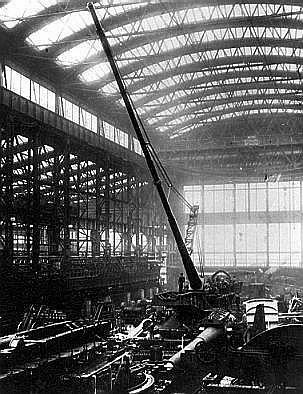 But as a psychological tool it was remembered when the V-1, V-2 and V-3 weapons were being developed two decades later. Seven 21-cm guns were made, using bored-out 38-cm naval guns fitted with special 40 m long inserted barrels. For most of the war there were only two mountings. After 65 shots the barrels were removed and re-bored to 24-cm caliber. At the end of the war one spare mounting was captured by American troops near Chateau-Thierry, but no gun was ever found. Maximum range: 131 km (81 mi). Family: Gun-launched. Country: Germany. Launch Sites: Peenemuende. Bibliography: 2, 47, 8475. 1918 March - . Launch Vehicle: Paris Gun. Paris Gun begins bombardment of Paris - . Nation: Germany. Apogee: 40 km (24 mi). Range: 131 km (81 mi). The rail-mounted weapon could hurl a 120 kg shell with 7 kg of explosive to a range of 131 km. During the 170 second trajectory the shell reached a maximum altitude at the edge of space - 40 km. This was the highest altitude attained by a man-made object until the first successful V-2 flight. From March through August of 1918, three of the guns shot 351 shells at Paris from the woods of Crepy, killing 256 and wounding 620. As a military weapon the gun was a failure - the payload was minuscule, the barrel needed replacement after 65 shots, and the accuracy was only good enough for city-sized targets. But as a psychological tool it was remembered when the V-1, V-2 and V-3 weapons were being developed two decades later.